This is the second year for Central Coast Comic Con (C4) in Ventura, and as an attendee I consider it a success. 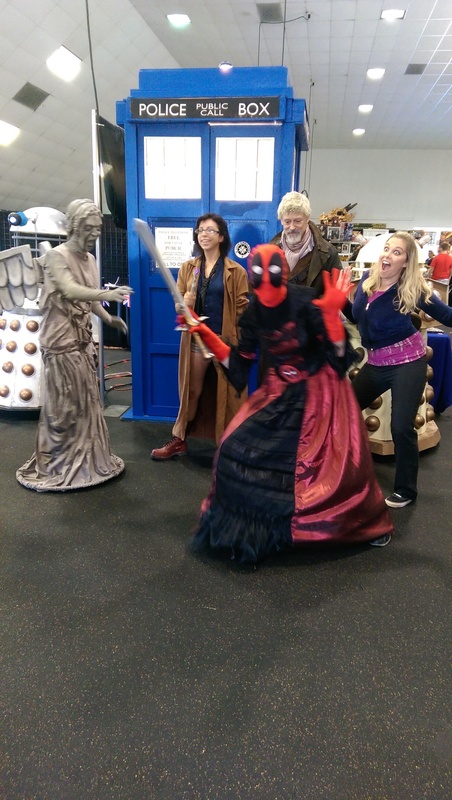 There were lots of vendors, a significant and well publicized set of panels, games of all types, a reasonable attendance of celebrities, several scheduled events, and a lot of cosplay - all of it taking place over two and a half days. Last year was pretty disappointing for a lot of reasons, and so I'm really glad the organizers learned from all of that and came back with a much stronger second year. We need a local convention, and now I have no qualms about recommending this one. Everyone I know who attended this year had a great time (although I did hear a few grumbles from vendors). I went all three days and enjoyed each day for different reasons. I think my favorite was Saturday when I served as a guide/chaperon for a group of teens attending their first comic convention. This group had heard me talk about San Diego Comic-Con and they all wanted to go some time. I try to redirect that kind of interest towards starting with smaller conventions, that way they can get some experience and decide whether they even like going to conventions. When I mentioned that C4 was coming up, one of the fathers suggested we make it a group outing, and so we drove down on a Saturday morning with two cars, four teens (two girls and two boys), two fathers, and me. 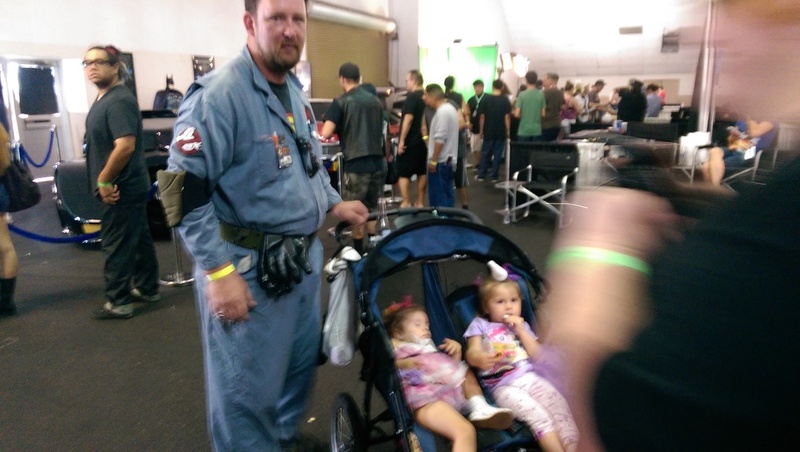 One of the fathers who came to the convention as a driver/chaperon - or was that just an excuse? 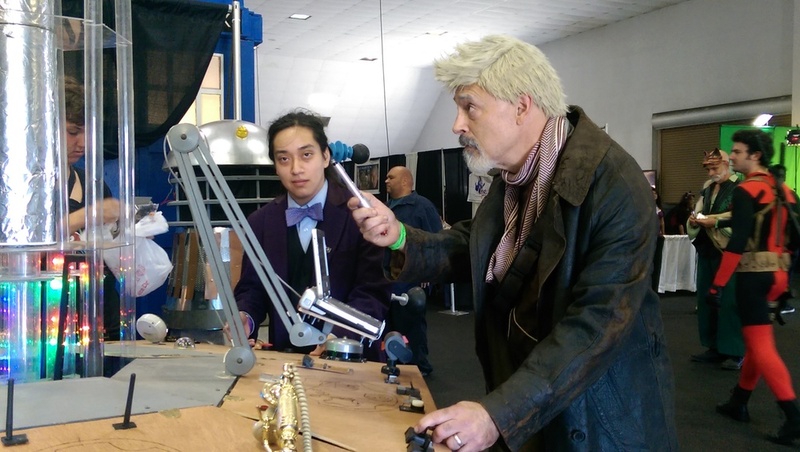 I wore the War Doctor costume, and one of the girls put together a steampunk costume. The others had said they were interested in going in costume, but couldn't get it together. I think that will change next time as they were intrigued by all the cosplay and realized it was a pretty common activity. 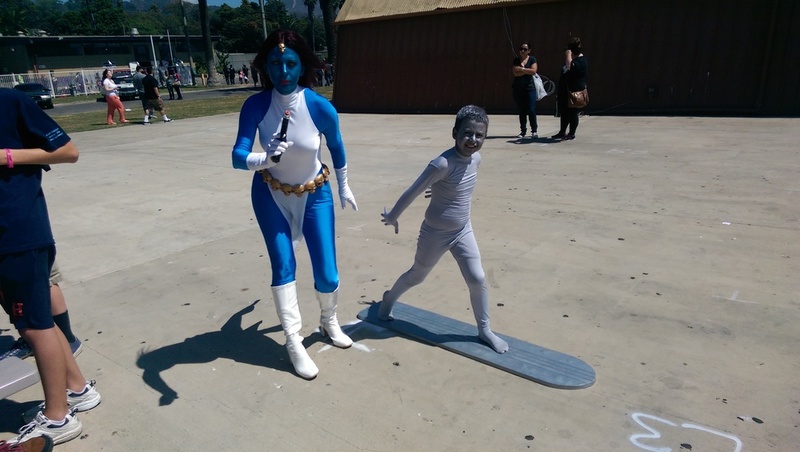 They also were exposed to the breadth of fandom and the variety of costume choices. The most memorable thing was how drawn the two girls were to all the bladed weapons. There were two vendors with swords, knives, throwing blades, etc. They spent a lot of time looking at everything. One had her eye on a full steel blade done in the style of The Legends of Zelda, and she was planning how to save up for it next year. They all got some great free swag (learning the advantages of arriving early), and all of them bought things they were interested in. We ate typically disappointing and overpriced convention food, and watched a geek fashion show as well as an SCA duel. I don't think any of them had the patience to attend a panel, but they all watched some activity of other that they found interesting. We left after 4 or 5 hours, as attention spans began to dwindle, but all said they had a fantastic time, planned on coming back next year, and talked about going to the next bigger convention (Wondercon is the one they hear me talk about, but it's in Anaheim and we'll see). As I mentioned earlier, there was a lot of cosplay which was great. The organizers really encouraged it with a lot of panels covering all kinds of cosplay topics. And there were two separate competitions, one of which was set aside for kids. They also had a Geek Fashion Show which seemed to be well attended and appreciated. The Geek Fashion Show, the line in the photo was designed by Girl With One Eye. I went back Sunday on my own and in the War Doctor costume. I had the chance to really interact with the other cosplayers. 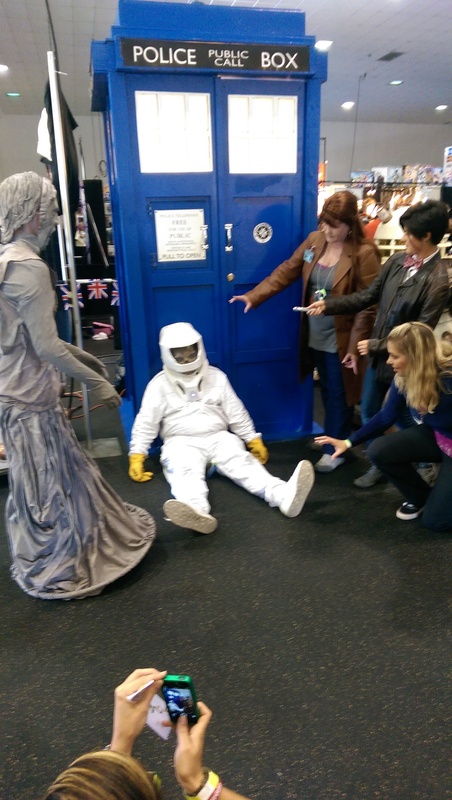 The Dr. Who fan group from Arizona (Az TARDIS) had a booth with a lot of big props, including a Tardis, a Tardis' console, a remote controlled Dalek and a remote controlled K-9 unit. The group was very friendly, and several of the Dr. Who cosplayers met up there to take pictures with everyone. That was a lot of fun with several doctors, a Rose, an Amy, several cross-play doctors, a Weeping Angel, and the Skeleton Astronaut. I spent some time at the discount comic vendors picking up some issues for my Fantastic Four run. I also sat in on several panels which were pretty good, and watched some martial arts demonstrations as well as the SCA dueling. I chatted with Sergio Aragones at his booth, and I even had the chance to meet some friends and just be geeky. All in all it was a complete comic-con experience and I look forward to seeing C4 grow in the future.